Make this quick five ingredient butternut squash soup for a simple and healthy dinner recipe. Made with butter, onions, butternut squash, water and salt. When I was working on recipes for the fall, I realized that I am severely lacking in butternut squash recipes. Which is a slight problem because butternut squash is probably the most popular squash out there and I like to have a variety of recipes on Living Lou for you to try your hand at. After all, if you search ‘butternut squash’ on my blog, I want to you actually find something you want to cook. I have plenty of recipes for other members of the squash family; the acorn squash soup I shared last year, and the roasted delicata squash I also shared last year. I meant to share this recipe earlier in the season, but I find that I’m positively overflowing with recipe ideas that somehow, it kept getting pushed back. I feel like I’ve been sharing, developing and testing about a thousand soup and stew recipes lately, but the truth is, this is the food that I am eating right now during these cozy and chilly last days of November and I think you are too. I find that batch cooking soups on the weekends has started to takeover my Instagram feed, everyone and I mean everyone are spending their Sundays cooking soups. 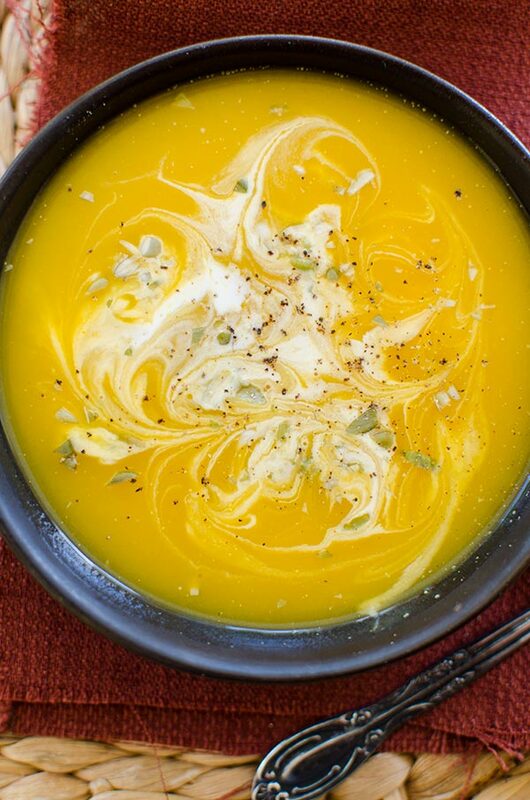 I hope that you make this quick five ingredient butternut squash soup this week. It’s such a Sunday kind of dish that is also great to have in the fridge throughout the week for lunches, because of my weekends spent making soups, I’ve been able to bring my lunch every day for the past three weeks which is pretty incredible (and I’ve saved a ton of money). I took a few days off recently, and can I just say how nice it is to have some time to breathe? Some time to chill out and watch the Gilmore Girls revival (of which I have many thoughts that I won’t write here in case of spoilers), time for cooking, time for writing, time for reading. Sometimes things can feel so rushed and just like I’m going through the motions, but having time to sit back and take things slowly was the perfect end-of-November change in perspective I needed. Things have started to come together and I feel like I’ve finally been able to shake those negative vibes that have been circling for the last couple of months. I started reading Shonda Rhimes’ Year of Yes a couple of days ago, I’ve been a fan of Greys Anatomy for years now, and this book as been on my list since it was released. Somehow, the timing of reading this book seems to be pretty perfect. I’m thinking that maybe 2017 should be a year of yes? I did a ‘summer of yes’ back in 2011, and it was the most fabulous summer ever, so I’m thinking, maybe this is something I should try out next year. I’ll keep you updated as I work my way through the book. 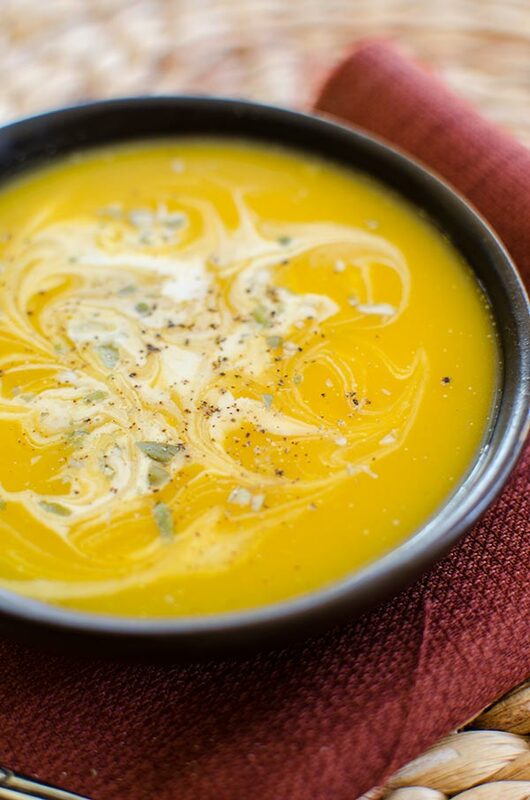 This butternut squash soup recipe is so velvety and delicious. The smooth texture of the soup comes from both the butternut squash as well as the butter which is used to saute and caramelize the onion (this gives the soup a ton of flavour). Along with butter, onions and butternut squash, the other two ingredients that make up this dish are water and salt. That’s it. I’ve made this soup with vegetable broth before, but I actually preferred the water version! You can definitely swap in vegetable broth if you want, but I would adjust the amount of salt as well. Also, if you want to cut down on time, try buying your squash pre-cut. Heat a large pot over medium heat. Add butter and onion, cook for 6 minutes until onions are slightly browned. Add squash and cook for another 6 minutes, stirring occasionally. Squash and onions should smell very sweet and fragrant. Add liquid and salt. Bring to a boil, cover, reduce heat to a simmer and cook for 15 minutes. Using an immersion blender or a blender, puree soup. Serve with a drizzle of cream and pumpkin seeds. Let me know if you give this five ingredient butternut squash soup recipe a try in the comments below. I just found your site and there are some awesome looking recipes on here. Can't wait to try them! Fantastic site Louisa! Thanks Kat! :) I really appreciate that.